Doosan unveiled its DA40 ADT at the Steinexpo exhibition, which took place from 3–6 September 2014 in Homberg, Germany. The Doosan Construction Equipment stand and working demonstration at Steinexpo 2014 included the very latest products for quarrying, mining, construction and recycling markets from Doosan Heavy, Bobcat, Doosan Portable Power and Montabert. The stand display featured the Doosan Heavy range of excavators, wheel loaders and articulated dump trucks; Bobcat compact loaders and compact excavators; portable compressors, generators and portable lighting equipment from Doosan Portable Power and Montabert hydraulic breakers and hydraulic drifters for drilling applications. The Doosan stand display included a number of Stage IIIB compliant models being shown for the first time at Steinexpo, namely the DX380NLC-3 crawler excavator equipped with a Montabert breaker, the DX530NLC-3 52 tonne crawler excavator, the DL420-3 wheel loader and the DA30 articulated dump truck (ADT). In the demonstration area, visitors were able to see the first appearance at an international show of the new Doosan Stage IV/Tier 4 Final compliant DA40 ADT, which worked together with the Stage IIIB compliant DX490NLC-3 excavator and the top-of-the-range DL550-3 wheel loader. Launched in June 2014, the new Stage IV/Tier 4 Final versions of the DA30 and DA40 ADTs go far beyond just meeting the latest emission standards and incorporate many additional features and product improvements to establish a new benchmark in load carrying performance, fuel efficiency, enhanced controllability and high operator comfort, together with improved reliability, durability and reduced maintenance and servicing costs. Bobcat showed the company’s new generation S450 skid-steer loader for the first time at Steinexpo. The new S450 model builds on the success of the S130 loader it replaces, by combining the advantages offered by a truly compact loader with many of the new features and improvements found on the larger Bobcat new generation models. As well as its compactness, the S450 skid-steer loader can be supplied with a comprehensive choice of 48 different product families of approved attachments (with more to come), offering solutions for a very wide range of applications and providing a perfect illustration of the Bobcat Tool Carrier concept common to all Bobcat compact loaders. Another new Bobcat product is the E85 8-tonne excavator, powered by a Yanmar 4TNV98C-VDB8 Stage IIIB compliant diesel engine providing 44.3kW of power at 2,100rpm. The new Bob catE85 excavator offers one of the best fuel efficiencies for this size of machine on the market. At Steinexpo, the E85 model was equipped with a Montabert hydraulic drifter. 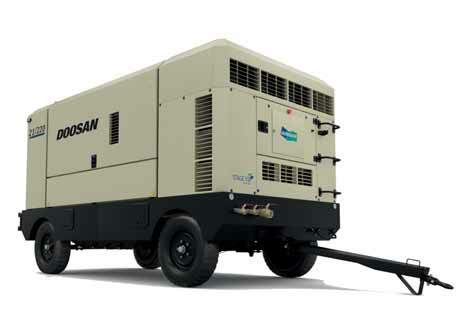 The products shown by Doosan Portable Power included the large 21/220 Stage IIIB compliant compressor and the G100-IIIA Stage IIIA compliant generator, the V9 Light Tower and the B2000 Balloon Light. The 21/220 model is part of a family of large Doosan portable compressors based on a common platform that also includes the new 9/275, 9/305, 12/250 and 17/240 models and offers free air deliveries from 21.5 to 30.0 m3/min at operating pressures from 8.6to21.0bar. The21/220 compressor and the others in the range are 31cm shorter than the previous Stage IIIA models, meeting a customer preference for both compact size and easy serviceability. The reduced size also offers advantages for truck- mounted configurations for the compressors. Like the 21/220 compressor, the G100-IIIA (100kVA prime power) generator offers robustness and reliability, high performance and a wide choice of features. Of particular interest is the innovative fuel tank frame system offering a containment base integrated as standard in the frame to ensure 110% fluid containment capacity. The G100-IIIA generator has a standard fuel capacity offering a minimum of 12 hours of autonomous operation (at 75% of the load), while a 24-hour onboard fuel tank configuration is available as an option.